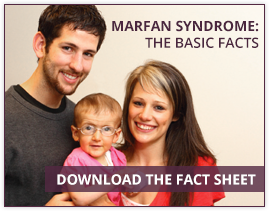 The Avitabile family has a long-time commitment to The Marfan Foundation. This year, Scott Avitabile received the 2017 Priscilla Ciccariello Award. Scott has been a member of the Foundation’s Board of Directors at different times over the past 20 years and is now a Board advisor. He played a critical role in our first capital campaign and the purchase of our headquarters building. An attorney, he has provided tens of thousands of dollars of pro bono counsel to the Foundation, is a long-time supporter of Heartworks, and – with his wife – has even competed in endurance events to raise money and awareness for the Foundation. Now, Keith Avitabile, who has Marfan, shares his story, which was the impetus for the family to get involved in the Foundation. Growing up, Keith Avitabile looked and felt different from his peers. In sixth grade, he was 6 feet tall with scoliosis. Without prescribed testosterone injections to stunt his growth, he was destined to be over 6 feet 10”. With the injections, he stopped growing at 6 feet 7”. Today, Keith is not only grateful for his diagnosis, he’s also grateful to be alive. The stress of dealing with his health conditions led to a relapse that had plagued his earlier years. In 1998, this caused a catastrophic aorta dissection, both ascending and descending, requiring total aorta valve and arch replacement surgery. His survival was in doubt, and he spent 21 days in the ICU. When Keith finally left the hospital, he was fifty pounds lighter, paralyzed on his right side, and shaken by his ordeal. He credits his loving family and doctors connected to The Marfan Foundation with helping in his recovery. His older brother, Scott Avitabile, became a strong supporter of the Foundation as an officer and a board member. His father, Dr. Stanton Avitabile, gave generous monetary gifts on behalf of the family to the Foundation. However, Keith’s health difficulties weren’t over. Circumstances continued to force him to draw upon his strong will to survive. The surgery left him with nerve damage and migraine auras, as well as difficulty with work-life balance, which led to a stomach bleed that infected his blood. After surviving this life-threatening crisis, Keith further demonstrated his perseverance by successfully winning a disability claim after two rejections. In Keith’s opinion, the lifestyle changes he’s made during this process have allowed him to beat the odds and survive. He feels that acceptance is especially important. “The first step is accepting that, although I feel ok and look pretty normal and healthy, I am disabled. Establishing routines and being aware of one’s own physical limitations is a start. And, most importantly, being thankful for all the blessings in my life makes me believe that I am still here for a reason. My journey is not over,” he said. Twenty years after his emergency aortic dissection, Keith is enjoying life, and plans to go off-road touring with his wife in their new 4x4 truck. “Every day is a blessing you cannot take for granted,” he says. Keith Avitabile, who was diagnosed with Marfan syndrome at the age of 25, lives in California.